Adolescent girls leading the agenda. From October 9-11, 2017 the CAMY Fund attended a meeting organized by UN Women, UNFPA and UNICEF in the Dominican Republic. The meeting was part of the UN agencies’ launch of a regional project, centered in five countries, to eradicate child marriage and early unions in Latin America and the Caribbean. The CAMY Fund has a vested interest in how the UN agencies work on this issue because we are beginning our own Latin American and Caribbean Initiative to Prevent and Address Early Unions in Girls and Adolescents. Parallel to the UN-organized break-out sessions, a group of adolescent girls met to map the issue of child marriage and early unions in their respective countries and develop recommendations addressing it at the local, national and regional levels. They presented three intersecting issues around child marriage and early unions that had not been mentioned by any of the country-specific groups, comprised mostly of adult women: 1) abortion, 2) discrimination and stigma and 3) mental health issues. With severe restrictions to access safe and legal abortion in many Latin American countries (97% of women of childbearing age in Latin America and the Caribbean live in countries where abortion is restricted or banned altogether), young girls have limited options when faced with an unwanted pregnancy except to potentially form a union with the responsible male partner. Discrimination and stigma around single adolescent motherhood oftentimes leads young girls to formalize their relationships with adolescent boys and men into unions in hopes of gaining social acceptance. Additionally, adolescents that are in an informal union may also face discrimination and stigma that limits their access to support and services. The adolescent girls at the meeting noted a “damned if you do, damned if you don’t” attitude towards them in general that is exemplified with this point. Recent evidence shows that self-harm has consistently ranked as the world’s first or second leading cause of death for adolescent girls. Poor mental health, including low self-esteem and depression, could likely be considered as both drivers and consequences of child marriage and early unions for adolescent girls. Adolescent girls need to be at the center of the work around early unions. This means we need to support youth-led programming that promotes adolescent girls’ voices and participation. There is a need for dissemination of information and further research into the drivers and consequences of early unions on adolescent girls in Latin America and the Caribbean. We need evidence-based solutions, not responses built on stigma and discrimination. We need to bring key actors together and broaden the stakeholders at the table. Many organizations are already doing work to prevent or address early unions, either directly or indirectly. We need to find a way to communicate, share, and coordinate actions for greater impact. This coordination also needs to reflect the intersectional aspect of this issue which also touches on sexual and reproductive health and rights, education, economic opportunities, migration, and violence in the region. 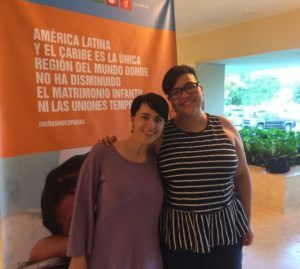 The CAMY Fund’s Latin American and Caribbean Initiative to Prevent and Address Early Unions in Girls and Adolescents, led by Perla Vazquez, includes all of the elements above. As a fund focused on youth in the region, we are uniquely positioned to move this work forward. I am appreciative of the participation of the girls at the meeting in the Dominican Republic who grounded us more in what this work needs to look like than any other takeaway I gleaned from the meeting.